The snow and cold just keep on coming here in Boston, which means it’s time to bring a little summer into your life. Sure, I adore my winter farmers’ market—eating local food high five!—but woman can not live on root vegetables alone. And who doesn’t love crostini? Sure, there’s the typical variant with tomatoes, mozzarella, and pesto Genovese, a summer favorite. I also adore French radish sandwich-style, with its herb butter and crisp radishes as colorful as they are delicious. 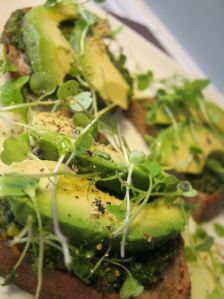 And let’s not forget about avocado with parsley-pistachio pesto and arugula. 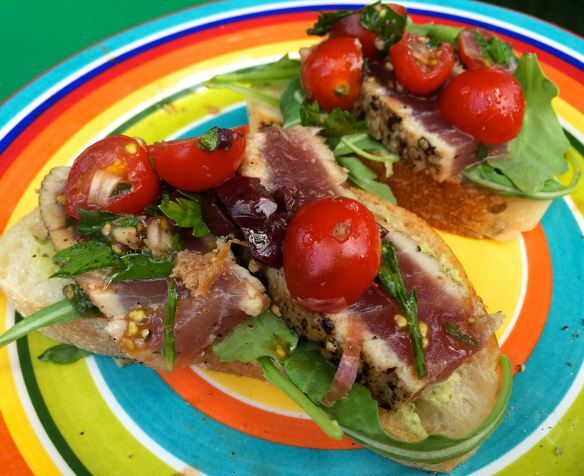 Whether toasted or not, a crusty baguette really is the perfect foil for all kinds of divine toppings that can be adjusted to suit season and taste. I had a batch of freshly made green goddess dressing in the refrigerator, so little else was required to prepare this dish. 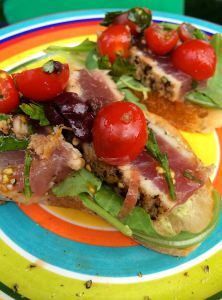 I toasted thinly sliced French bread seasoned with olive oil and black pepper as shown here and quickly seared salt and pepper-ed tuna to rare. 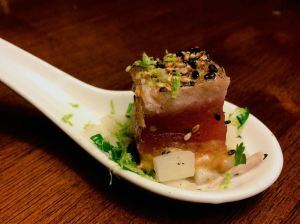 (Here’s more on how to sear fish alongside some farm to fork food facts about tuna.) I prepared a simple topping of sliced cherry tomatoes, parsley, scallion, and Kalamata olives tossed with olive oil, balsamic vinegar, and S & P, a burst of acidity and color to complete the dish. I packed up everything to go, along with the ingredients for my cucumber basil sparkler, and we were off! When we had settled into our spot on the lawn, I poured our drinks and assembled the crostini with a slather of Green Goddess, leaf of arugula, slice of tuna, and spoonful of tomato-olive garnish. Of course this dish is best when sweet summer tomatoes and herbs are in season, but it works just as well whenever you just need a little sunshine on your plate. And sometimes that’s in the middle of winter. These look perfect for a lunch outside here in Cali. 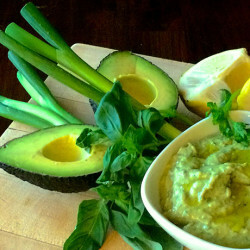 I post a lot of healthy and delicious recipes on my blog. Check it out if you can. I would love your feedback too! We’re having a rough winter here in the South too. Can’t wait until delicious, fresh produce like this are on our plate again!